the Aaron Hoyt barn, which is associated with the track. 2.) Wes Moody may be its most famous export. When Aaron Hoyt got his inspiration to start a race track on his land near Lake Colby, NY, it may have been as much to keep his adventurous son, Jimmy, out of trouble with his pals like Wes "Slugger" Moody, as it was to establish a big - name New York race track. Although known as Saranac Lake, the track was located on the Hoyt family farm [which was in Lake Colby]. Hoyt, the Chrysler dealer in Saranac Lake, was able to scratch out a track with a minimum of equipment and expense. The facility always struggled t o make ends meet because its bucolic location made it too easy for folks to sneak in and watch the races for free. The diminutive Hoyt was always concerned that turns three and four were too close to his beloved barn;, so he had the habit of leaving his full manure spreader in such a location as to serve as a buffer for the barn against errant stock cars. It did buffer once - when Paul Whitmarsh went off #3 and ended up with a mouth and a car full of nature's fertilizer. The best driver in the track's main division, the NASCAR limited sportsman cars, was Bob Bruno, with the legendary Vic Wolfe #66. He was made out to be the track villain by the local paper. The best hobby class entry, by far, was the Mac Bushey #43 - a 1955 Chevy driven by Lake Colby's John "Rebel" Rushlaw. Rushlaw, just as beloved as Bruno was disliked, won almost every race he was in at the track. The oval was strange. It went uphill in one place and downhill in another. The Hoyts dealt with the dust problem with used oil. While the Hoyt son, Jim, showed great promise in the NASCAR sportsman ranks, his career was shortened, early on, by a bad crash at Fonda. Jim's friend, Wes Moody, would probably be the most famous [or infamous, as the case may be] graduate of Saranac Lake Speedway. The track began around 1959. 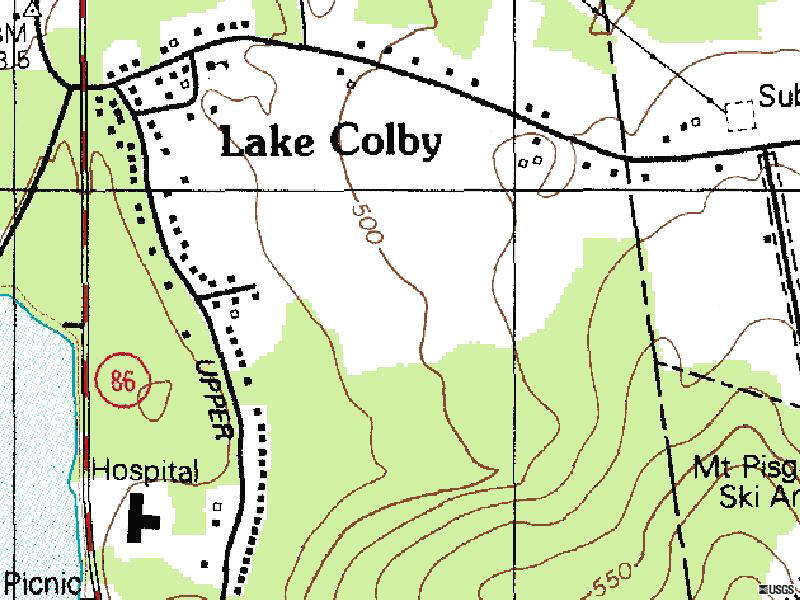 No one can agree on when he closed, but most agree it was not operating in 1968.
to the town of Lake Colby than it is to greater Saranac Lake. 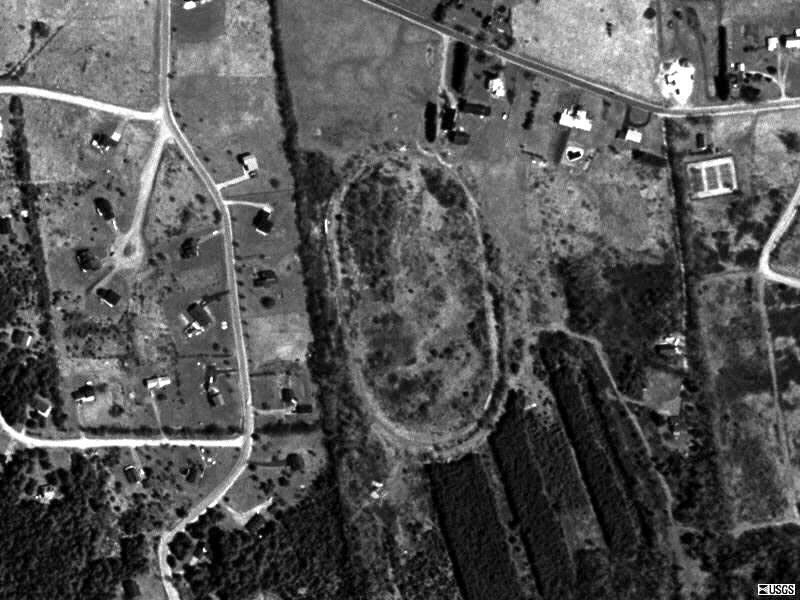 The old Saranac Lake Speedway is located halfway between the left side of that diagonal line running from lower right to upper left and the short street of the trailer park that points straight out to the right and stops. I am not sure what the diagonal line is - it isn't a road. Saranac Lake pace car - around 1964. A former Don House XL-1. The Fonda crash car that ended his career. Car is supposed to be a hobby class entry. One of the best to come out of the region in the earlier sportsman era. Vic Wolfe's 66. The team was so good here they were portrayed as track villains by local papers. capture shows Jim Hoyt with his 1st car at his dad's track. capture shows Jim Hoyt with his 1st car at his dad's track - at the first races. 8 mm film capture shows Malletts Bay star and Airborne feature record wins holder, Bob Bushey at Saranac Lake. 8 mm film capture shows a heat start on the 1st race program. 8 mm film capture shows "Moody's Goose", the sketchy 1st race car of Wes Moody. 8 mm film capture shows car 169 with checkers. Very poor quality shot. others work at the simple registration table near the pit entrance. with Saranac Lake starter Art Prairie after winning a feature at the track in the Adirondacks. Return to the All Links Page.